The new Hyundai Creta now comes in five key variants and offers a bunch of premium features like electric sunroof, 17-inch diamond cut alloys, wireless charging and more. The 2018 Hyundai Creta facelift finally received its long-awaited mid-cycle facelift this month and we have already driven the new Hyundai Creta and shared our experience with you. The 2018 Creta facelift has received a major update after almost three years since its launch and Hyundai India has made sure that the wait was worth it by offering a host of exterior and interior updates that have made the 2018 Creta facelift smarter and more upmarket. 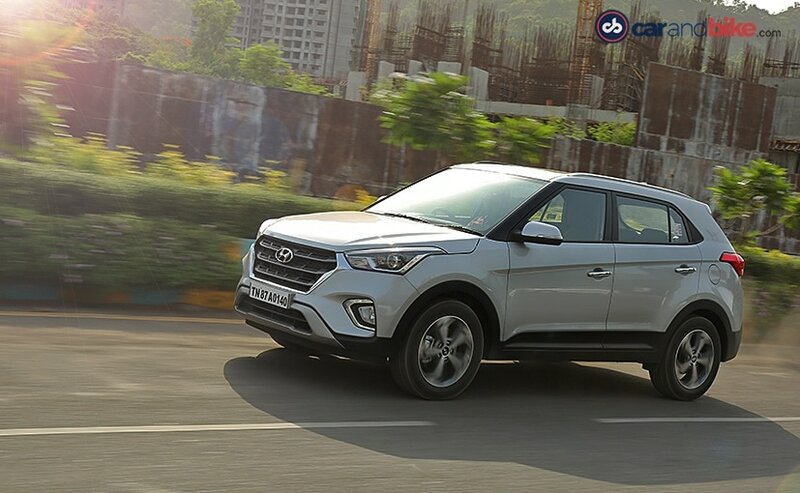 Hyundai India has also cut down on a couple of variants bringing to total to five - E, E+, S, SX (also in dual tone trim), and SX(O), and here's a detailed explanation as to what each variant has to offer. 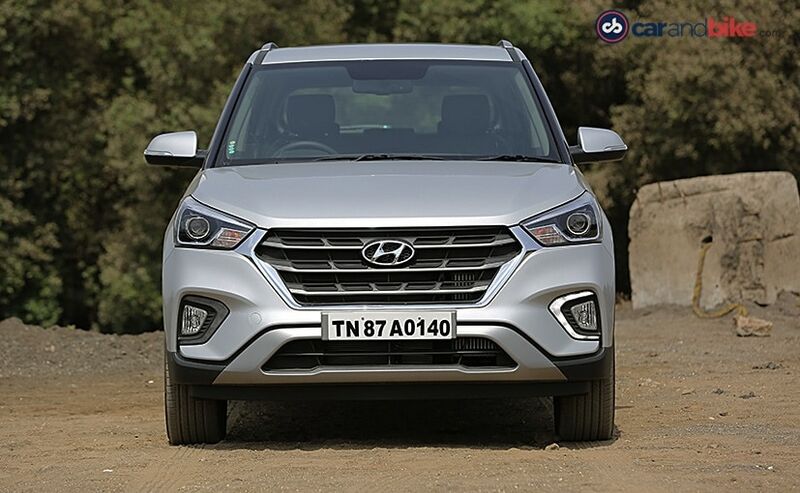 Hyundai India has certainly updated the base model to offer more features now and there are a lot of standard offerings as part of the package. Starting with the exterior the 2018 Creta facelift now gets silver skid plates as standard along with blacked out A- and B-pillars. The base model gets standard halogen headlamps with follow me home function, black grille with silver accents, body colour bumpers, door handles and ORVMs, black underbody and side cladding, micro roof antenna and rear body colour garnish. The cabin, at the same time, comes with an all-black theme, fabric upholstery, matte finished crash pad garnish, and black scuff plates. 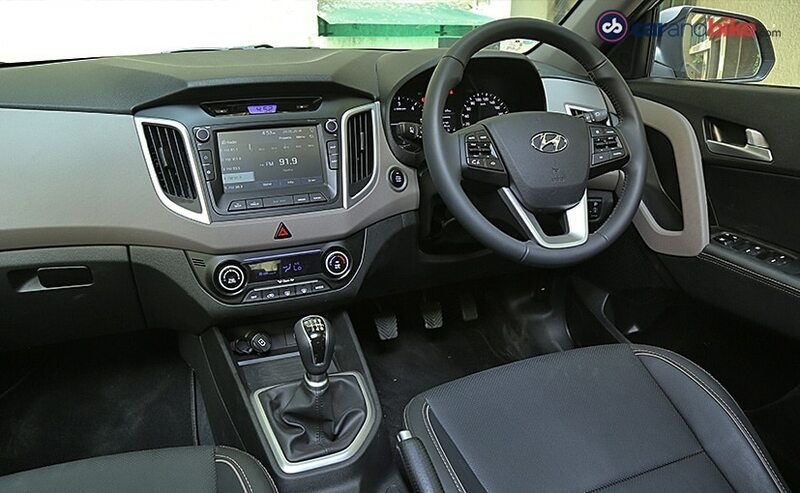 The new Hyundai Creta gets a standard instrument cluster with a tachometer and gear indicator, keyless entry, manual air conditioning, front sliding armrest with storage compartment, a dead pedal, rear AC vents, and front power outlet. The base model also gets power steering with tilt function, all 4 power windows and height adjustable driver seat. Sadly, the base model E doesn't get any in-car entertainment feature, not even a 2-DIN audio system. 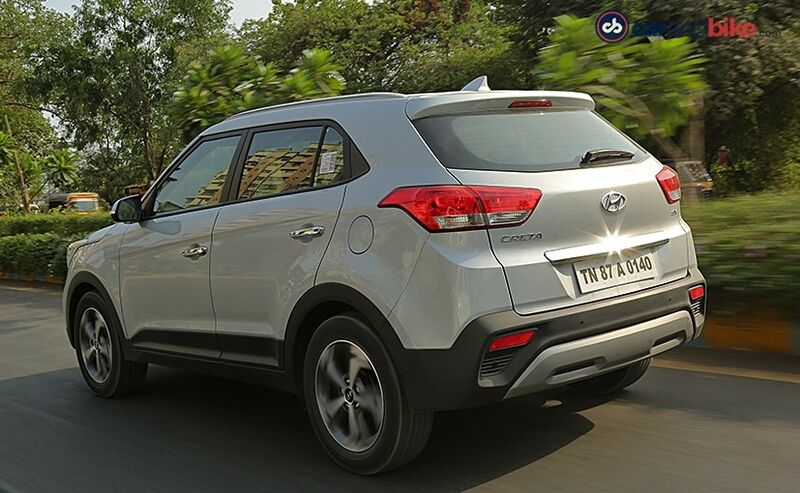 However, its great on safety though as the new Hyundai Creta facelift comes with features like - dual front airbags, ABS with EBD, day/night inner rear-view mirror, front seatbelts with pretensioner, impact sensing door unlock, speed sensing lock, and engine immobiliser. Adding on to the features of the base model E, the E+ variant only comes with one exterior update which is integrated LED turn indicators on the ORVMs. The cabin, on the other hand, comes with few additional bits like - electrically adjustable ORVMs, front USB charger (petrol model only), luggage area camp, along with a front map lamp and sunglasses holder (both petrol only). 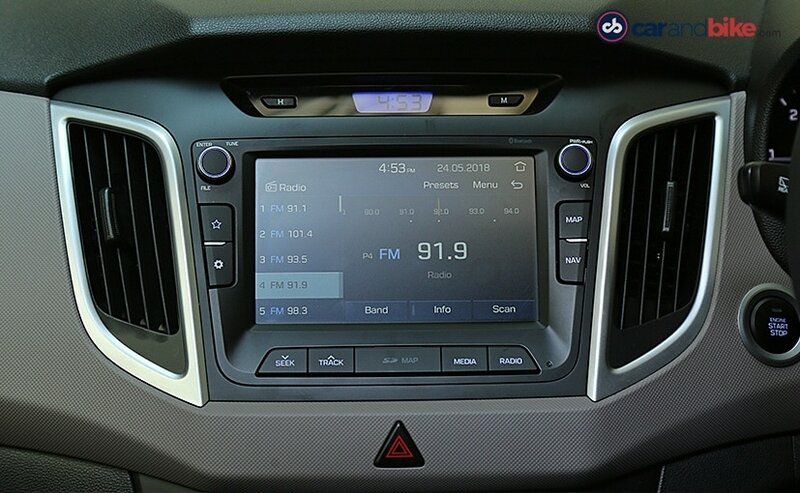 The biggest update, however, for the petrol variant at least, is 5-inch touchscreen audio system with USB and Mp3 player, which comes with Bluetooth connectivity and 1GB internal storage. 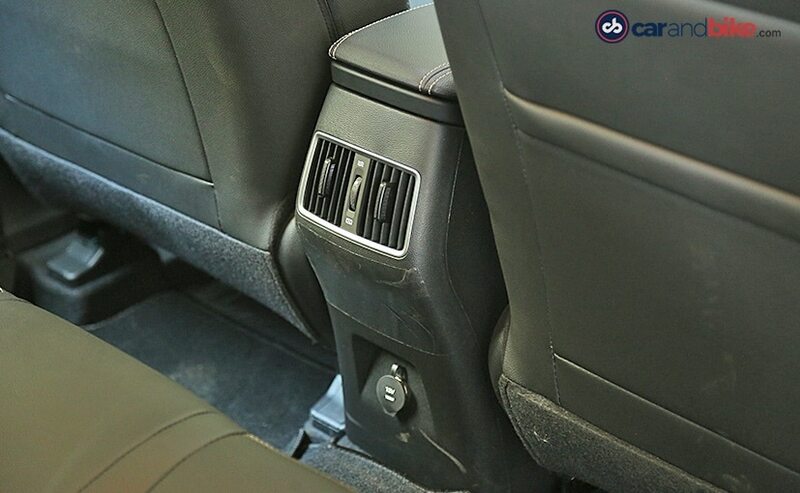 There are steering mounted controls for audio and Bluetooth, Hyundai i-Blue audio remote app, 4 speakers and 2 tweeters. The safety features remain the same as on the E trim. In addition to the features offered in the E+ variant, the S trim comes with a bunch of premium offerings like 16-inch alloy wheels, LED daytime running lamps, and roof rails. As for the cabin, Hyundai offers small addition like matte finished inside door handles, rear parcel tray, and front USB charger for both petrol and diesel option, and a rear power outlet. The new Hyundai Creta also gets a rear armrest with cup holders, luggage net and hook, and adjustable rear headrests. In the S trim, both the petrol and diesel version get the 5-inch touchscreen audio system with all the support features mentioned above. As for safety features, the S trim comes with additions like - rear parking sensors, rear camera with parking guideline on centre display, front foglamps and rear defogger with timer. The S variant also comes with the option for an automatic transmission. In addition to the features offered in the S trim, the SX variant comes with offerings like - the new 17-inch diamond cut alloys for the automatic and dual tone trims (single tone manual gets the 16-inch alloys), Bi-functional projector headlamps with cornering lights, LED position lights, chrome accents for the grille, rear chrome garnish (only for single tone option), chrome finished door handles, and shark fin antenna. The dual tone option gets a piano black roof. The SX trim also offers a more decked up cabin with leather-wrapped steering wheel and gear shift knob, metallic scuff plates, electric sunroof (AT only), cruise control, smart key with push-button start/stop function, automatic climate control with cluster ionizer, electrically foldable ORVMs, rear windscreen wiper with washer, diver side up-down safety power window, and 60:40 split rear seat (AT only). From the SX trim and above the 2018 Creta facelift offers a larger 7-inch touchscreen infotainment system with video and navigation, which is also equipped with Apple CarPlay, Android Auto, and Mirror Link, along with Arkamys sound mood. The SX trim also offers ISOFIX child seat mounts in the automatic trim option. The SX dual tone variant gets an exclusive cabin as well, with silver accents on the dashboard, black fabric seats with orange accents and contrast stitching, orange accents on the leather-wrapped gear knob, TGS gaitor boot with contrast stitching, and leather-wrapped steering with contrast stitching. In addition to the offerings of the single tone SX trim, the top-end SX(O) variant offers a host of premium additions like - standard 17-inch diamond cut alloys, leather seats, leather-wrapped console armrest, leather-wrapped door armrests. The SX(O) trim also comes with an intuitive, supervision instrument cluster, standard electric sunroof, and 6-way power adjustable driver seat. As part of connectivity, the SX(O) trim also gets Hyundai new smart key band (with mobile app), and wireless charging facility. As part of safety package, the Creta SX(O) gets a total of six airbags (side and curtain included), electronic stability control, vehicle stability management control, hill start assist, electro chromic mirror, height adjustable front seatbelts, and lane change flash adjustment.